QUALITY GAGING TIPS MMS JANUARY 2018 32 mmsonline.com Measurement Tools After the part has been designed and manufac- tured, it must, of course, be inspected. For sur- faces specified only by a roughness parameter, this is simple. Pocket-sized, battery-powered gages that offer a small number of roughness parameters are available at low cost. They are easy to use and can be very flexible. More complex parameters require full-featured instruments that are run by computers and may cost thousands of dollars. Standards are written around the use of instru- ments that measure part texture by moving a stylus in a straight line across the surface and by monitoring the vertical movement of the stylus. Generally, the less-expensive stylus-type gages that measure only roughness use the surface of the part itself as a reference. These are called skidded gages. 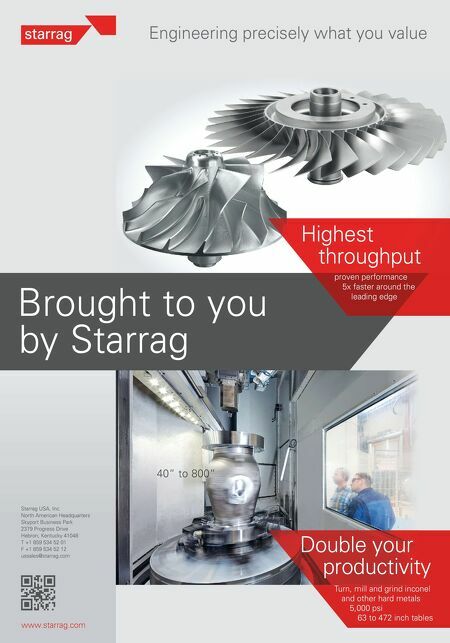 In contrast, full-featured instru- ments incorporate a precision internal reference surface, which enables them to measure waviness and total profile in addition to roughness. These are called skidless gages. Inexpensive, compact "roughness" (skidded) gages, however, often retain their traditional utility, even where more complex parameters are specified. A shop may maintain one "roughness/ profiling" (skidless) system for manufacturing engineering and quality assurance purposes, while making basic roughness gages readily available to machinists. Once the process is established and confirmed on the roughness gage, the design engi- neer uses the profiling gages to measure parts for their specific parameter call out. AUTHOR | George Schuetz Director of Precision Gages, Mahr Inc. After a part has been manufactured, it must be inspected. For surfaces specified only by a roughness parameter, a pocket-sized, battery-powered gage is a simple solution. I N N O V A T I O N O V E R 4 0 Y E A R S O F When you need quality, fast—count on Renishaw! We manufacture thousands of precision-engineered styli for the world's most demanding high-accuracy applications and with manufacturing right here in the U.S., even custom designs can be in your hands fast. 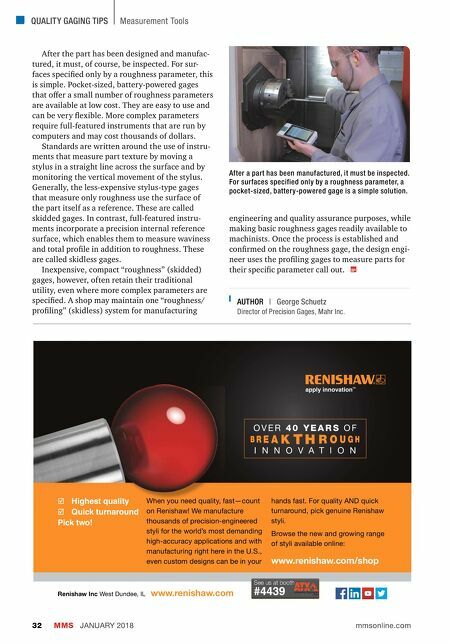 For quality AND quick turnaround, pick genuine Renishaw styli. Browse the new and growing range of styli available online: www.renishaw.com/shop Renishaw Inc West Dundee, IL www.renishaw.com Highest quality Quick turnaround Pick two!